The mini downhill series is now in it’s 10th year. On a wet Sunday morning in January Kate joined 21 other women entered across 4 race categories managed to pick up 3rd place in the Masters category. Here’s her race report. 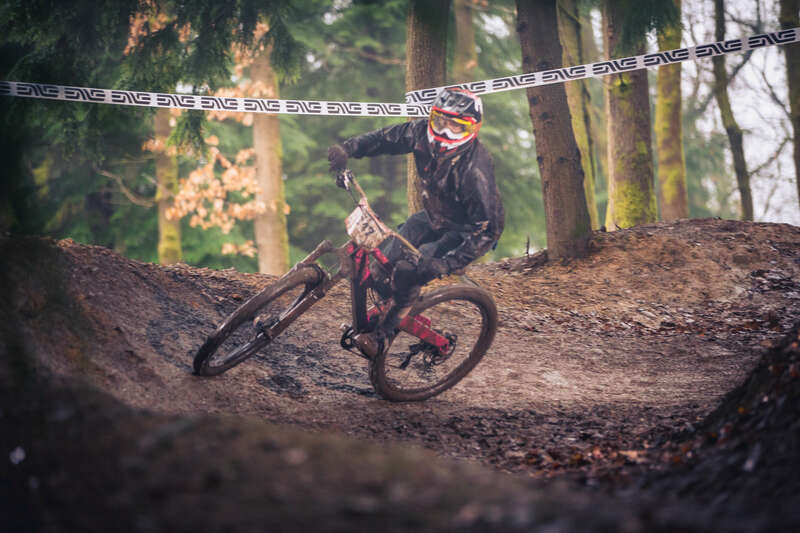 Still on a high from competing last weekend, I was now heading to the Forest of Dean in Gloucestershire to take part in Round 2 of the Mini Downhill race. This race utilises the downhill tracks maximising the fun element, although still tricky in places putting those much needed skills to use. I travelled down the Friday before the race to have a practice and was heading for the ‘Sheep Skull’ track (interesting name!) As I loaded my bike on the uplift and hopped in the van, I was greeted by some familiar faces encountered whilst competing in Round 1 (always a welcomed bonus!) We all decided to session the track together, happy days! Sheep Skull is a tricky, fast course starting with a twisty single track into a small bomb hole that opens out into a mass of roots and I mean roots galore! Good grief! Anyway… after the roots have been tackled you swoop down over the fire road trying to resist grabbing at the brakes over yet more cheeky roots, until you hit the final section of jumps and berms to the finish. Our group practice proved to be very entertaining and chucklesome, with all of us hitting the deck at some point, at the most daftest of places. Good job it wasn’t race day, hey! After a few runs down the track, it soon became apparent that there was a quicker line through the maze of roots – we practiced different approaches to this section and had plans on safer lines, weather dependent and boy! the weather was hard on us! Race day arrived on the Sunday……what a slop fest! The track had become wild and wet, not to mention extremely slippy! These conditions proved a challenge during the practice runs, which saw me skidding off the bike at speed, with a battered shin and a tetanus jab (a day later) I picked myself up and headed back to the top ready for my first of two race runs. I lined up with the rest of the girls ready to start run one. I was covered in mud with a throbbing shin, but chomping on the bit to get cracking – I was the last to be set off in my category and as the buzzer sounded I peddled hard into the twisty single track, my tyres trying their hardest to grip I entered the bomb hole and completely missed my planned line into the roots, never mind! I was slower than I had hoped but I tackled them without a slip so i carried on with confidence. Keeping off the brakes I gathered speed over the fire road and down through the steep muddy single track, staying light over the roots and keeping to my lines. To my surprise I caught up with the girl ahead and followed behind not being able to pass through the jumps and winding berms, to the finish line. I was sat in 4th place but my time was still competitive. I had come on leaps and bounds since my first visit to the Forest of Dean so I was happy! All the girls were in high spirits gathered at the bottom of the track and it was smiles all round as we had a warm next to the fire in the Cafe. Off for run two and this time we were seeded to start. I managed to hold my line into the roots section this time, albeit still a slower negotiation than I’d hoped. Onwards and forwards I gave it my all after the fire road, determined to keep the bike from sliding away from under me it was a quick dab with my foot on a few occasions, but I was enjoying it! By the time I got to the jumps and berms my legs were screaming at me, but the cheers from my team mate’s and the marshalls on the sideline drove me on to the finish line – I’ve never been so out of breath in my life! The timings were tight and I was super chuffed to have bagged the 3rd place ! Overall I was pleased with my run, identifying that I need to work on negotiating large root sections and that perhaps confidence is the key! The girls I rode with in practice on Friday were great fun and a valuable help. Credit to the event organisers, marshals and medics who kept the day running smoothly even after an unfortunate accident forced practice to be cut short, seeing the course shut temporarily. A brilliant event yet again and I’m looking forward to round 3 next Month and meeting up with all the girls again.